I'm off again on another kitchen-table refurb. An update to my previous saga: I bid on a Miele Naturell thinking I'd get a return on the disaster of a DC26 I'd won last month. Turned out the Dyson seller refunded me and didn't want the machine back (was going to trash it, got it working, my SO is very, very pleased). Won the Miele as the only bidder and it'll make a lovely upstairs companion to my mother's DC07 in her 3-floor row house. I'll tell you, it was a real pleasure tearing down this machine, since it smelled like dryer sheets instead of sewage and relied on screws instead of friction-fit tabs. I meticulously photographed the disassembly, but as I removed the bag indicator, it sprang open across my living room, obviously before I could photograph its orientation. It's a strange circular thing, very different then the sliding piston in my old S2. 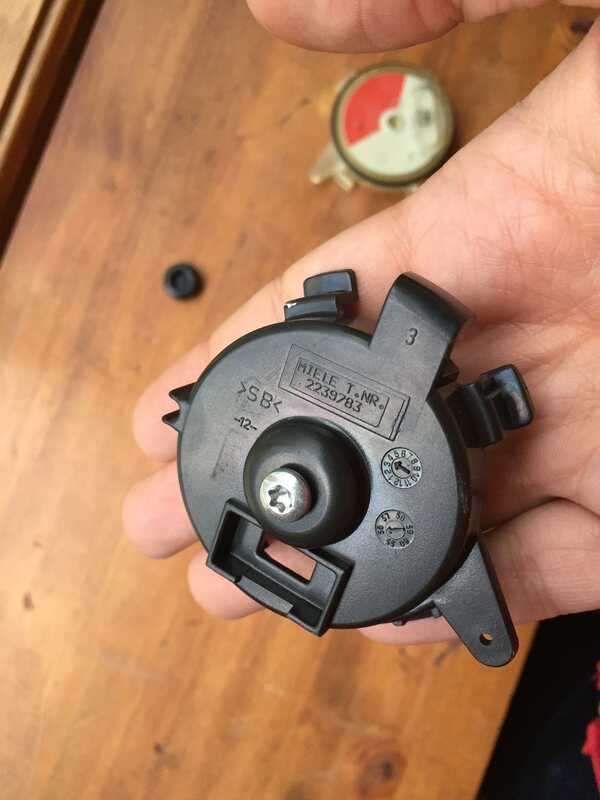 I'm curious if anyone knows the order of assembly on this, or the orientation of the colored indicator--I feel like I saw a technical bulletin on manualslib on bag indicators a while back, but I'm stumped on which one it was. In more exciting news, I managed to get an accompanying turbo head and wand from someone who'd bought a Delphi and upgraded to electric--never used, for $25USD! The spring! I knew I was forgetting something. I was rearranging my furniture in the den and found a very large spring that appears to be of teutonic origin, under some boxes that I've finally gotten around to unpacking. It's difficult to describe, but this series uses a very peculiar type of indicator. It consists of a rubber diaphragm with a helical receiver into which a disc-type display sits in and rotates about as pressure changes. Essentially it would simply turn red as soon as the vacuum turned on. It's in my mother's possession now, and she doesn't mind, having never had a cleaner with an indicator, and it working far better for her purposes than the dyson.. The one service manual I could find mentioning it really only said only not to mess with it essentially, and I'd feared I'd ruined it by throwing it into the dishwasher with the rest of the parts. Next time I'm visiting the family I'll replace the spring--and bring photos, of course. It's not a proper job if you don't have something left over, don't worry! As you say, the piston indicator is nothing more than just a good guess, it could go red on half a bag if it fills with finer dust, or stay on green but be jammed full of coarse dirt. Physically check the bag every week or so for a more accurate view! Next time I'm over at the family's, I'll take some photos of the device. This rotary-type indicator also has an adjustment screw--I just need to figure out where in the assembly the spring goes. 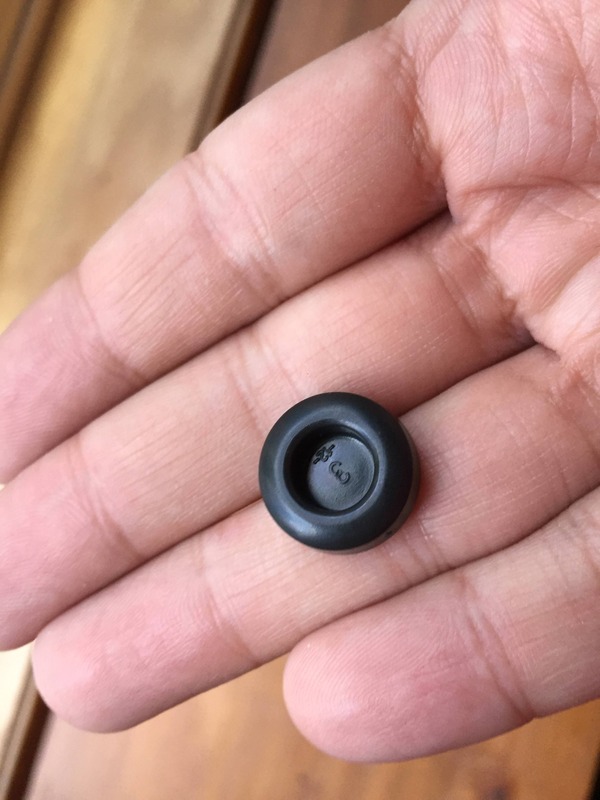 Not sure if this is the right type, but it shows where the spring is located: on the centre lug and in front of the 2 plastic pegs. 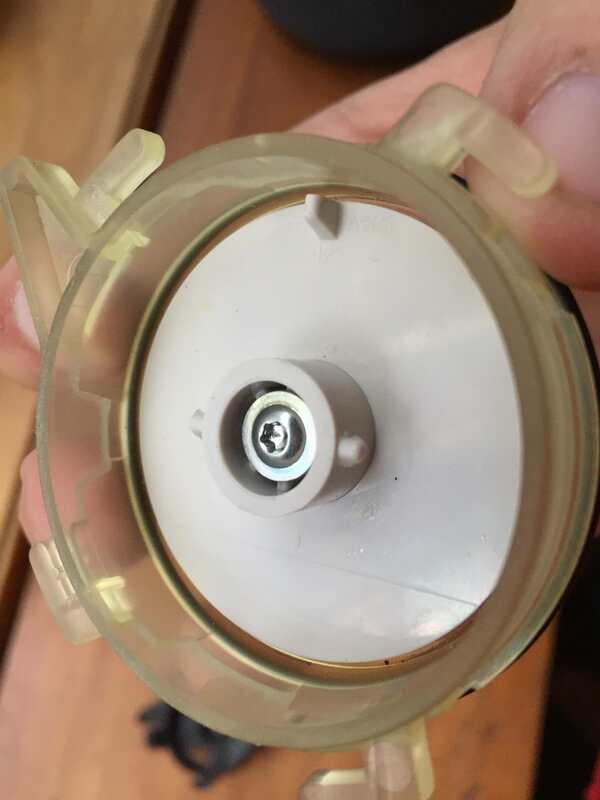 this is the indicator, you can kind of see that it's a rotating disc with a red wedge. 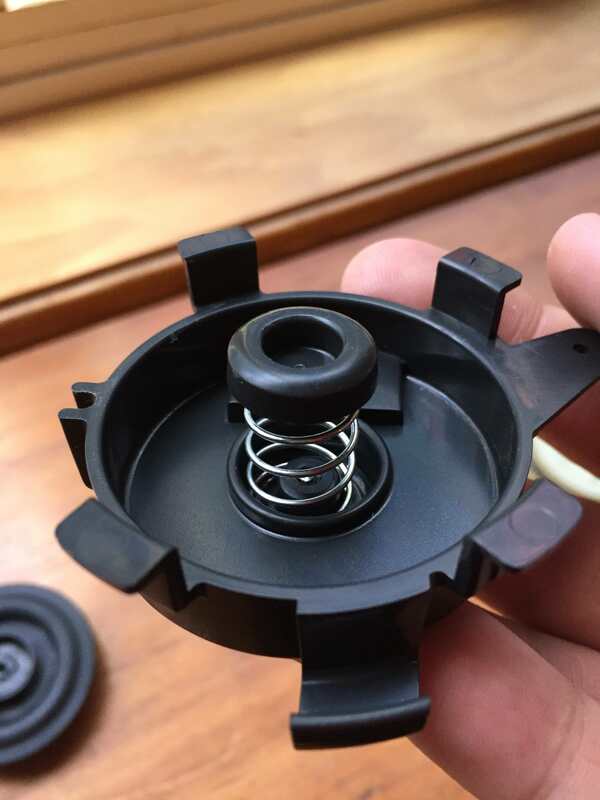 the bottom has a protrusion that sits inside a helical receptacle on a rubber diaphragm, so that it spins as the pressure differential changes. I'm going to guess the spring sits under the diaphragm rather than between it and the disc. Pictures at long last: Finally made it out to visit this weekend. 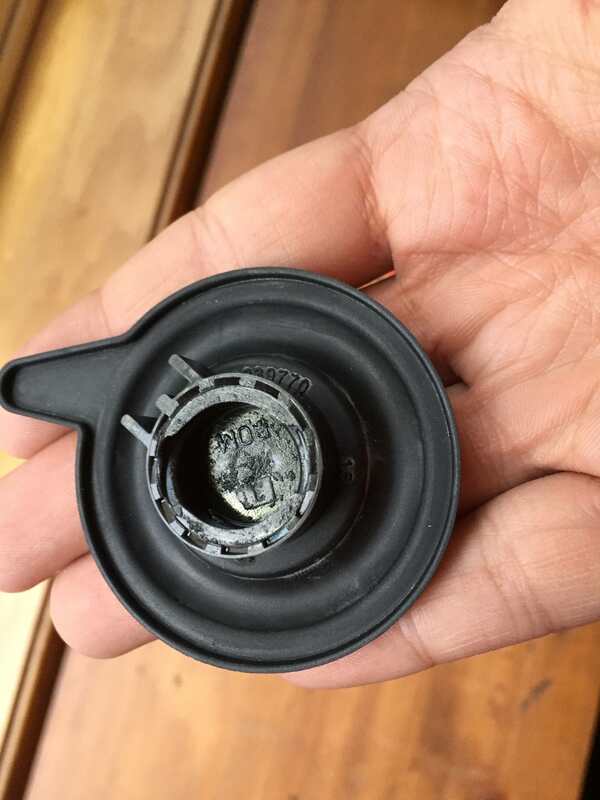 My mother's DC14's cylinder cracked and continued to get used, and the whole thing is covered in a nice thick layer of dust for a week before she took the Miele over for primary duty. Amazing (well no, not really) how much better a canister is for above-the-floor cleaning...especially stairs. Here's the whole assembly, disassembled. 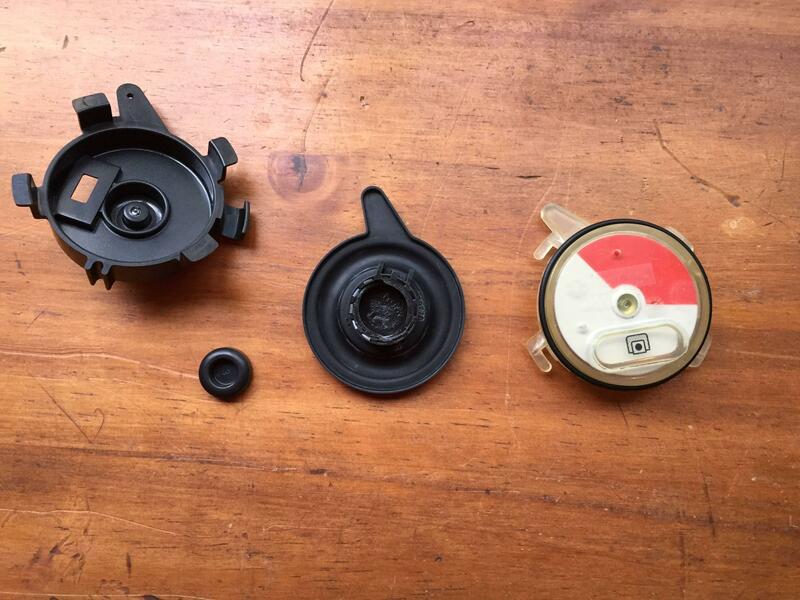 L-R: Lower carrier, some sort of bearing piece, rubber diaphragm, and indicator dial and cover. 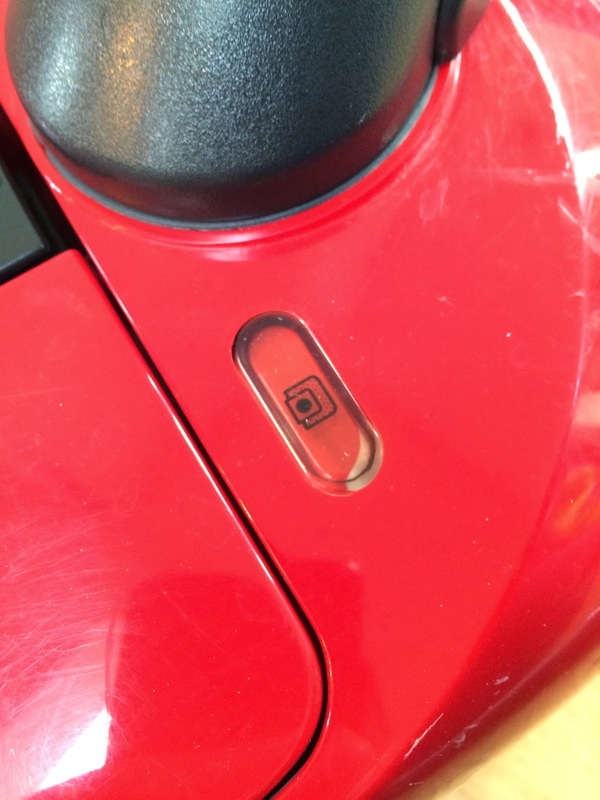 There's a small hole in the clear cover piece to allow for pressure differential to be measured. It's essentially an aneroid barometer. Lower piece in detail, with adjusting screw. Not sure how exactly the adjustment works, functionally. The spring clearly goes on one side of this bearing piece. However, I'm not sure if the side with the depression goes against the diaphragm or the lower bit. But hey, it fits this way and works when reassembled reasonably well. So as you can see, the return spring is a bit crucial to this mechanism. Glad I found it rolling around on my living room floor! I'll try and figure out how to calibrate it better, since this cleaner is used in a home with an incredibly hairy dog, so I anticipate the bag will fill quite quickly with pet hair before suction is reduced.